These tools from Robert Sorby were developed by a professional turner to make groups of side by side beads easily, quickly and accurately. As the tool is slowly pushed into the wood the handle is moved a little side to side. 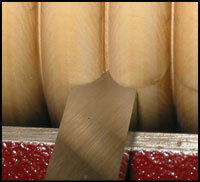 These tools can also be used to form a radiused edge on faceplate turnings. The Easy Beader is available in three sizes: 1/4", 3/8", and 1/2". Each tool is made of 1/4" thick M2 high speed steel come fitted with an ash handle. Each tool has an overall length of 13".